Sewing Apron’s – A great Gift idea! Sewing Apron’s for family and friends is a favourite sewing project of mine! You can make quick and easy apron’s or be as fancy and decorative with theme’s and personalise them as you like! 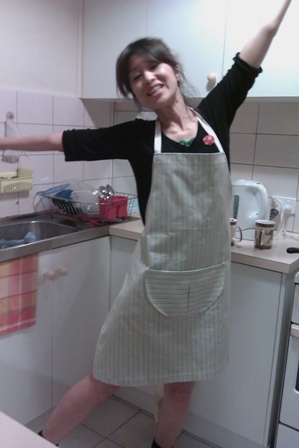 Here is a picture of my daughter Jacqueline in her kitchen wearing her newest apron I made for her. As we both love cooking apron’s are a must have! 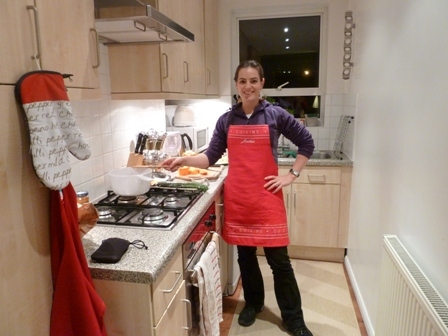 This one is a very quick and simple apron cut out from a red ‘cuisine’ extra large tea towel! I featured her name embroidered at the top. 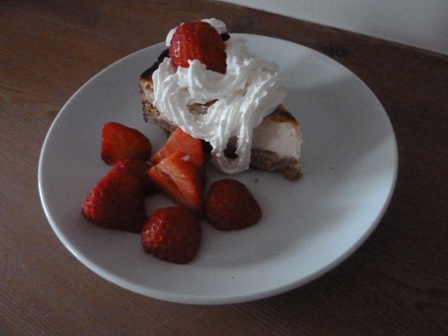 And here is what she cooked for me to say ‘Thanks Mum!’ Her delicious baked cheesecake with strawberries & cream! Perfect for an afternoon tea together! Below is a lovely apron made from a student of mine Elaine. 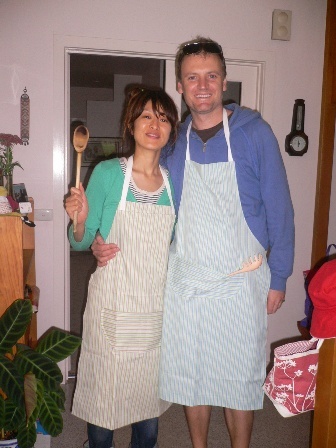 Elaine made this apron in my sewing classes for Chrisuna and a matching apron for her son Malcolm! The aprons below are made from a striped cotton drill and features a great divided pocket at the front! Great job Elaine! 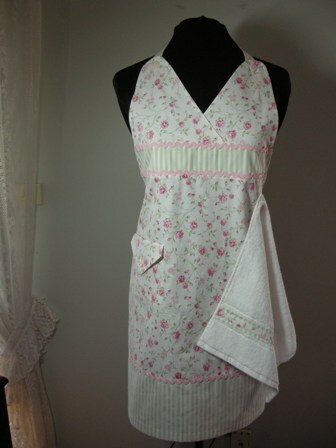 For an apron with extra detailing, below is a “pretty in pink apron” I made for my daughter-in-law. It features a V cross over neckline, co-ordinating fabrics, ric-rac, a side pocket and hand towel attached with a button. I hope you have enjoyed this blog post on sewing apron’s for a great gift idea! If you would like to learn how to sew contact me today! I would love to hear from you if you liked this blog post so please leave me a comment below!